KPU President Alan Davis sat down with Canadian author, journalist, and military historian Gwynne Dyer for the university’s President’s Dialogue talk series on April 10. 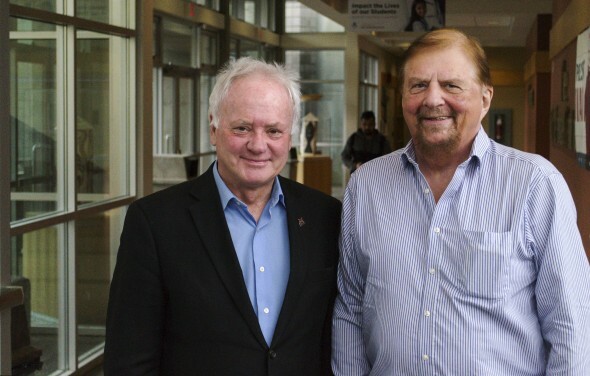 The talk was held in the conference centre on KPU’s Surrey campus and focused on current issues in global politics in the wake of Donald Trump’s presidency. In general, the President’s Dialogue series is an ongoing program hosted by Davis with influential speakers from a wide variety of backgrounds. Dyer currently writes a bi-weekly column on international affairs, has published 12 books, and produced several television and radio programs. Davis says that he wants to have conversations with people of “national or international stature” who are of interest to the KPU community. The talks are open to the KPU student body and the public at large. “We have these opportunities to bring people in and rather than simply have a lecture, it’s a different format of being able to engage big names, as it were, in an event that is engaging, that is informative and hopefully fun for them,” says Davis. Throughout the hour-and-a-half-long talk, Dyer spoke on several topics related to Trump’s presidency and ongoing foreign affairs. First was Dyer’s take on the United State’s recent bombing of a military airstrip in Syria in response to a chemical weapon attack on civilians by Syrian forces. Davis and Dyer also discussed the relationship between the Trump administration and Russia. Dyer mentioned the ongoing Sunni/Shia civil wars in Iraq and Syria—conflicts which she says may be coming to a quick end. Dyer predicts that Trump will collaborate with the Russian government for a resolution to the conflicts that will keep Shia regimes in power and allow for the U.S. to pull out of the region. Another topic discussed was the United States moving backwards on climate action under the Trump administration. Dyer says that other countries will have to take the lead in the fight against climate change, and in many cases, they already are. Davis and Dyer went on to discuss Trump’s use of the immigration issue to get himself elected, with Dyer noting that the areas of the United States with the fewest immigrants voted overwhelmingly in favor of Trump, largely due to a fear of immigration. This event was put together at a time when many in academia—including KPU community members—are feeling anxiety about having Donald Trump in the White House. Davis himself recalls a feeling of “slight nausea” upon hearing the news of Trump’s election back in November. “When you spend your life, as people in universities often do, trying to fight for the side of goodness and right, for civil rights, women’s rights, gay rights, etcetera, and you’ve gone through all the cycles of, in some cases, very very difficult political activism and gradually see things change, gradually see improvement, and then you’re getting towards the end of your career and then this happens, it’s almost like going back 20 years,” says Davis. Davis could not provide details of future guests set to speak at his President’s Dialogue series, but says he is interested in hosting internationally recognized people from a wide variety of perspectives. “I’ve got my own opinion about these things, but as president of KPU, I’m open to all ideas. I would hope that I would be open about having anybody who has influence and wants to have a dialogue to come and engage with us,” says Davis.